Many visitors come to Swansea Museum to see the Egyptian Mummy. 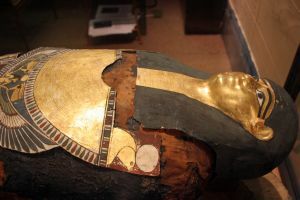 The mummy, identified as Hor, was a clothier priest and scribe of the God Atum. In the daily ritual of the temple it was his duty to change the clothing on the holy statue of the God. He lived in Akhmim in Upper Egypt between 250-200 B.C. during the Ptolemaic Dynasty and was named after the God Horus. The mummy was gifted to Swansea Museum in 1888 by Field-Marshal Lord Francis Grenfell, who was born in the St. Thomas area of Swansea in 1841. Grenfell chose an army career rather than join his family’s copper business. In 1882 he was posted to Egypt and in 1885 he became Commander-in-Chief or Sirdar of the British Army in Egypt. His sister, Mary Grenfell visited him in Egypt and encouraged him in his pursuits of archaeology and Egyptian history to the extent that he enlisted the help of archaeologist, Wallis Budge who was instrumental in purchasing the mummy, its coffin and other smaller items for the Royal Institution of South Wales (the former name of Swansea Museum). An account of the mummy’s arrival at the Museum appeared in The Cambrian newspaper on 2nd November,1888, while the new Egyptian display was opened by Miss Mary Grenfell. The mummy is on display in Swansea Museum in the Egyptian Gallery.